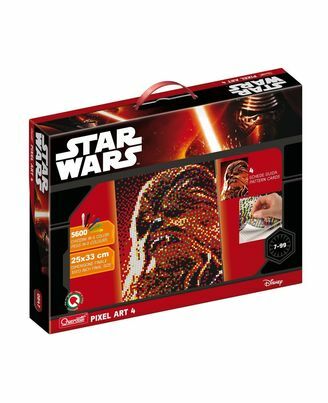 With pixel art anyone, adults or children, can create amazing pictures of star wars characters using the famous Quercetti pegs. Cut the pattern cards, place them on the perforated pegboards, insert the pegs and you’re ready to go. The pegs come in only 6 different colours, but if you look from the right distance, they blend magically into an image with thousands of new colours and tones, as if it were a real photo. Basically, pixel art is the first product in the toy world to use the phenomenon known as “optical mix”, which is the technique the “pointillism” painters of the late 19th century used to create wonderful paintings. Each package includes 2 connecting joints, you can collect all the characters and join them in a single panel. Here we’re using pegs instead of oil paints, but the result is just as impressive. Pixel art’s is is made following very high standards of quality and safety and can be used to decorate your home with a touch of class.